This is my card 'studio' (aka the corner of my bedroom). It's been a pretty lonely place lately. It's been just over a month since my sweet little kitty, Bliss, lost his battle to cancer. Every Friday, we had a tradition to sit on my floor together and bust out some new Lisscat Creations cards. Well, thinking back, I did most of the work, while Bliss would oh so helpfully chew on paper, ribbons, paint brushes, and whatever else was necessary in the making of that card. In Bliss' absence, I taped a picture of us to the wall in the corner. The only problem was, it didn't help inspire me, but only reminded me of how much I missed him. So, needless to say, the card 'studio' has been quite neglected. For those of you who have received cards in the past month, its miraculous those ever got done! Whats funny, er, not funny, but ironic is.... The night before Bliss died i started writing a blog (it was never posted). I was grieving, but was ready. I was ready to let him go, and ready to let his constant playful joy in life inspire me to keep actively following my passions. But as soon as he was gone, any joy I thought I would have was overshadowed by grief, loneliness, anger... all those feelings no one likes to feel. So sadly, I confess, I let myself grieve, and ignored my art that I had wanted to create inspire others. Then on Wednesday I received a text from a friend. The preview of the text read "In memory of Bliss". 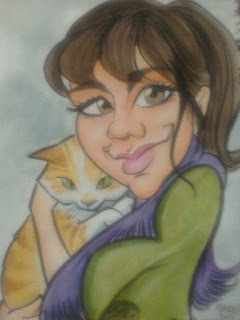 My dear sweet friend and her amazingly talented husband thought to draw this out for me. I was floored! Aren't you? Its so freaking amazing and beautiful! So.... THANK YOU so much to Laura and Marco Garcia for the beautiful picture, and for digging out a part of me that needed to breathe. On a final note: Since he was young, Bliss endured so many surgeries, procedures, medications, etc. But he was a fighter, and he chose joy. Despite all the pain and sickness, he was always playing and NONSTOP purring. I want to be like that. I want to ignore the circumstances, and CHOOSE JOY.